Roasting the turkey is probably the most nerve-wracking part of Thanksgiving for the hosting cook, and for good reason. The turkey is a challenging piece of meat for even experienced chefs. Keeping the white meat moist without over- or under-cooking it is key. The last thing your guests want is turkey so dry they need to drench it in gravy or turkey so undercooked they get sick. But roasting a juicy turkey that won’t even need gravy is achievable! One great method for imparting flavor is by brining your turkey first. If you’re trying a wet brine for the first time, this tutorial video we put together using our Gourmet Gobbler brine kits available in-store can help walk you through the steps. A wet brine will take 24-48 hours to soak in. If you have closer to 48+ hours before your celebration, you can try a dry brine, too. Remove the giblets from turkey cavities after thawing. Cook separately. Set oven temperature no lower than 325°F. Place turkey or turkey breast on lower rack in a shallow roasting pan. For even cooking, bake stufﬁng in a separate casserole dish, versus in the bird. Use a food thermometer to check the internal temperature of the stufﬁng. The center should reach 165°F. If you choose to stuff your turkey, the ingredients can be prepared ahead of time. Separate wet and dry ingredients, and chill wet ingredients (butter/margarine, cooked celery and onions, broth, etc.) until ready to prepare. Mix wet and dry ingredients together just before ﬁlling the turkey cavities. Fill the cavities loosely. Cook the turkey immediately. Use a food thermometer to make sure the center of the stufﬁng reaches 165°F. 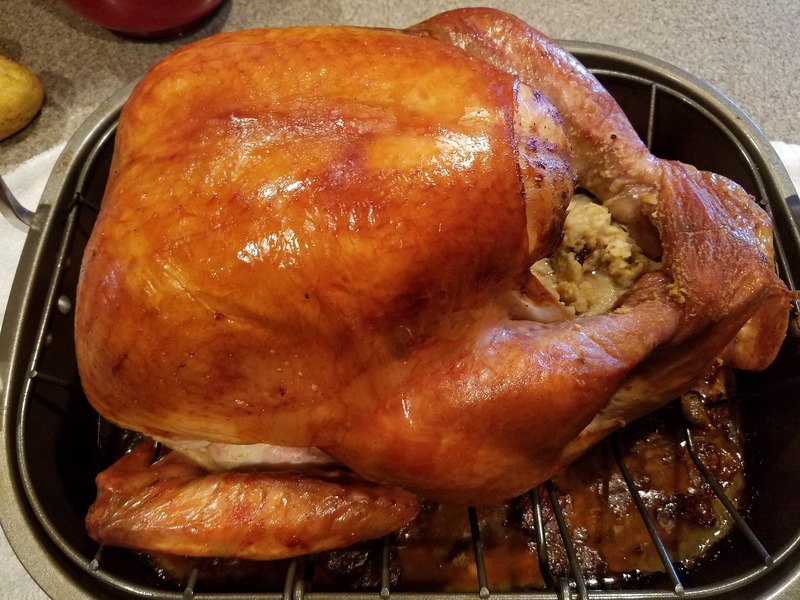 Whole turkeys should be cooked to 165°F. To check for doneness, insert a food thermometer in the thickest part of the inner thigh without touching the bone. Turkey breasts should be cooked to 165°F. Insert a food thermometer in the thickest part of the breast to check for doneness. Oven times are approximate and will vary. Always use a meat thermometer to ensure the correct internal temperature of 165°F has been reached. Keep the turkey wrapped and place it in a pan. Let it stand in the refrigerator roughly 24 hours for each 5 pounds. Large turkeys should stand in refrigerator a maximum of 5 days. The giblets and neck, which are customarily packed in the neck and body cavities of frozen turkeys, may be removed from the bird near the end of the thawing period. If desired, the giblets and neck may be refrigerated and reserved for use in giblet gravy. Make certain that the turkey is in a leak-proof package or a zipper-seal plastic bag. This prevents bacteria in the surrounding environment from being introduced into the food, and prevents the poultry tissues from absorbing water. Change the cold water every 30 minutes. Approximately 30 minutes per pound of turkey are required for thawing. After thawing in cold water, the turkey should be cooked immediately.